Lots to discuss tonight – I’m pretty excited. 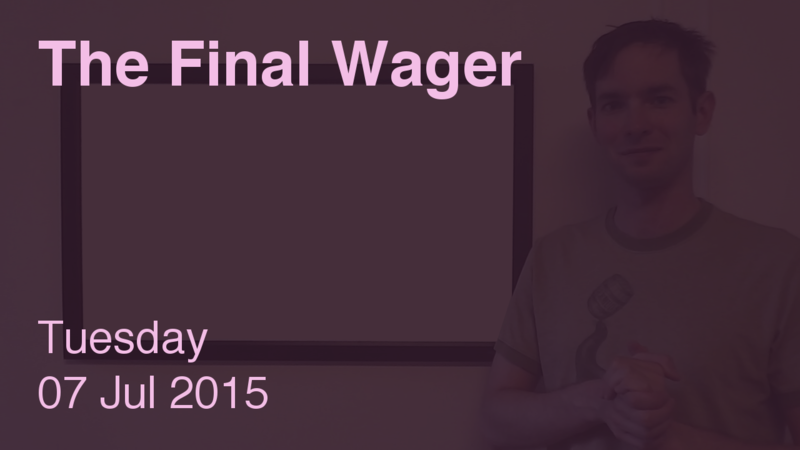 The Penultimate Wager is quite intriguing – I’ll edit this post in a bit to include information on that. I also talk about it in the video. If Jess doubles her score, she’ll have 16,800. To cover this all-in wager, Bridget will need to wager 6,600. An incorrect response with that wager will leave Bridget with 3,600. To stay above her total, Jess can wager up to 4,800. Sawyer can wager up to 4,000. A successful doubling will put Sawyer at 15,200. To cover this, Jess should wager at least 6,800. In this case, though, she will lose on an incorrect response, so she might as well wager everything. Sawyer could also cap his wager at 2,400 if he’s worried about the 5,00 wager from Bridget. If Jess makes the rational maximum wager of 4,800, Bridget will need to wager 3,000 to cover her. Congrats to Sawyer, who is a good friend of The Final Wager. Here’s hoping he can repeat Wednesday!